Meet your guide in Ella and set off after an introduction to your hike. Wear a hat and comfortable shoes, and if you wish, bring a packed breakfast. Start with a round-trip hike up Little Adam’s Peak. 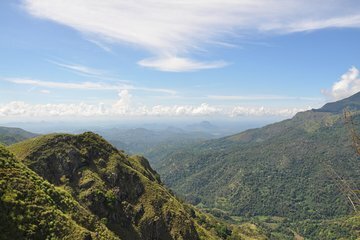 This verdant 3,743-foot (1,141-meter) hill is named after the bigger, similarly shaped Adam’s Peak — Sri Lanka’s fifth highest mountain. Ascend through the emerald tea plantations, and at the top, admire the spectacular, far-reaching views — at their best during morning — over the island's central highlands and tea plantations. After descending, enjoy your packed breakfast or refreshments (own expense) from the local stalls, or choose to eat (own expense) at the nearby 98 Acres resort. Next, take an approximately walk through woodlands to the famous Nine Arches Bridge, a British colonial-era viaduct standing 100 feet (30.5 meters) high. Walk across this rail bridge and uncover its history as you absorb the beautiful surroundings. Then, follow the rail line to Demodara railway station, home to a charming British-built station house. See how the track loops back through an under-station tunnel here and learn why it was designed this way. Your tour then concludes here when your guide departs. Well worth doing. Our guide Dilan was very helpful and took the day at our pace stopping when we wanted for photo or rest. The path is steep and rocky in places, walking sandals ok. Beautiful views. Had a good lunch stop before walking to 9 arch bridge in time to see train.